Republicans hope to prevent an embarrassing loss in Ohio's 12th congressional district, which the GOP has held for 35 years. WASHINGTON — The congressional special election in Ohio is down to the wire. With 100 percent of precincts reporting Tuesday night, the candidates were separated by 1,754 votes, making the race too close to call, NBC News projected. Republican Troy Balderson had 50 percent, or 101,574 votes, while Democrat Danny O'Connor had 49 percent, or 99,820 votes. But more than 3,400 provisional votes and 5,048 outstanding absentee ballots — nearly quadruple the margin — remained to be counted. State law bars boards of elections from counting those ballots until the 11th day after an election. Tune in to NBCNews.com at 12 p.m. ET to watch “Way Too Early." Steve Kornacki and guests will break down Tuesday’s special election in Ohio and discuss how voters are feeling ahead of the midterms. The race could be headed to a recount, since state law triggers one if the candidates are within half a percent of each other after the final results are certified, which must take place no later than Aug. 24. 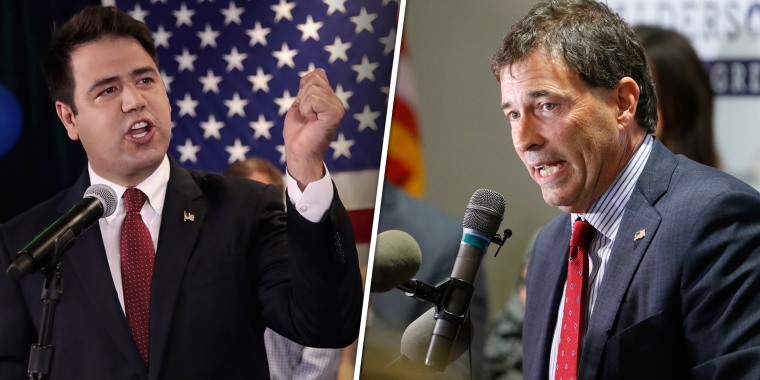 Still, that didn't stop Republicans from claiming victory Tuesday, including President Donald Trump, who endorsed Balderson and campaigned for him in the district on Saturday. In a tweet, Trump took credit for Balderson's razor-thin lead, even though the last Republican to represent the district won it by 36 percentage points less than two years ago, and Trump himself won it by 11 points. Speaking to supporters, Balderson thanked Trump and Vice President Mike Pence for stumping for him in the home stretch, and vowed to "do everything I can to keep America great again" while representing the district in Washington. He also got a last-minute boost from Ohio Gov. John Kasich, a Republican Trump critic who used to represent the district and was initially hesitant to back Balderson. O'Connor, meanwhile, did not concede the contest on Tuesday night, but touted how close it was. "In a race that the pundits said we had no chance even being in, you proved them wrong," he told supporters. Rep. Ben Ray Luján, D-N.M., who leads House Democrats' campaign arm, touted the neck-and-neck vote as a positive sign for his party's hopes of winning the House in November. "This district should have been a slam dunk for the GOP, and the fact that we are still counting ballots is an ominous sign for their prospects in November," he said in a statement. Both parties see the election as a test of Trump's strength and as a potential bellwether of the Democrats' chances of picking up the 23 seats they need to flip the House. Balderson and O'Connor will face off again in a November rematch to compete for a full term in Congress, since Tuesday's election was just to fill the remainder of the term of Rep. Pat Tiberi, who resigned to take a private sector job. In an interview with MSNBC's "Morning Joe" Wednesday morning, O’Connor reiterated that the race was still too close to call and said he is excited to keep campaigning through November. "The margin is 1,700 votes. We have 8,000 votes yet to be counted," he said. "And we have an election in November. The fight continues. We'll be out there campaigning, we're not resting because people are counting on us to get it done for them." Since last year, Republican groups have spent more than $40 million on TV ads to defend just a handful of congressional seats in their own turf in special elections. And even as the GOP claimed victory, the Congressional Leadership Fund, a major conservative super PAC aligned with Speaker Paul Ryan, issued a warning to other Republican candidates. "While we won tonight, this remains a very tough political environment and moving forward," said the fund's executive director, Cory Bliss. "Any Republican running for Congress getting vastly outraised by an opponent needs to start raising more money." Republicans have won five out of seven competitive House and Senate special elections this cycle, but it's come at a price. In Ohio, the biggest spender has been CLF, which has run $2.7 million in TV ads, according to Advertising Analytics. By contrast, Balderson's campaign itself has spent only $515,000 on TV. O’Connor's campaign, meanwhile, has spent $2.3 million on ads, which have likely had a bigger impact than the super PACs, thanks to discounted rates available only to candidates. All told, five of the biggest GOP outside groups — the Republican National Committee, the party's official House and Senate campaign arms, plus the Congressional and Senate Leadership Fund super PACs — spent $36.95 million on TV ads in the seven special elections before Ohio, according to Advertising Analytics. And they dropped close to $5 million more in Tuesday's race. That's compared to just $11.5 million from their five Democratic counterparts, who have had to spend less since their candidates have been able to raise more money on their own and needed less help. Meanwhile, in a Michigan Democratic gubernatorial primary, Gretchen Whitmer easily defeated Abdul El-Sayed, a Bernie Sanders-backed candidate who was seeking to become the first Muslim governor in the country, the AP projected. And in Missouri, voters appear on track to vote down a Right to Work law that the Republican-controlled state legislature passed last year, but which unions challenged by putting it on Tuesday's ballot as a referendum.